Nothing to deal with the bestseller, assured. As you may already know, the DS 2D core supports paletted and direct colors, both of which are expressed using 5 bits per primary color (red, green, blue). This is 15bpp, also known as HiColor mode. Having 'only' five bits per primary color means that there are just 32 different shades of gray that can be defined including the darkest - black, and the brightest - white. Back in 2008, while reading GBATek specifications, I had found out that the DS screens were 18bpp LCD panels, so I started a topic on gbadev forum suggesting that there might be a way to exploit this. It turned out that using the hardware alpha blending capabilities of the 2D core you can indeed force the hardware to show real 18bpp images. Fellow forum member Cydrak has even posted a very good demo then, and here's his original forum post with the link to his 18bpp demo. So, having now 6 bits per primary color, it's possible to display 64 shades of grey. The improvement is significant, even if banding is still noticeable. Pushing this thing further has been tickling me since then, so very recently I decided to give it a try. Of course, the hardware limit of 18bpp can't be overcome, and the display can't show more colors than what it's capable of. However, having a 2D core that can generate 60 frames per second, we can exploit the human eye persistence of vision. The idea here is that if we display two slightly different images alternatively at a sufficient high rate (60 times per second is surely high enough), our retinas will just perceive a sort of an average of the two images. And that's what we get: 127 shades of grey. Even if you know that the additional 63 shades aren't really there, they're simply the result of our perception. 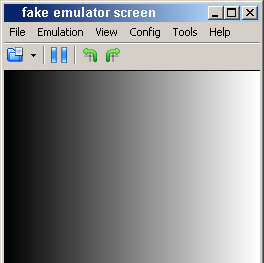 Note: the second and third image in this post are fake: there are no emulators that can show 18bpp and, of course, there's no way of making any emulator show the image that your eyes perceive. So, I suggest that you test the demo yourself on your DS. You can download it here. In my August posts I focused on the improvements done with DSx86's ARM ASM smooth scaling routine where I did my best to make it as fast as possible, knowing that every CPU cycle saved there would turn useful in the emulation main loop. Then it took me a few more months to realize that actually the same result can be achieved by properly programming the NDS 2D graphical core. So here's how I did it. The smooth scaling routine takes groups of five 256-color pixels on the same line and turns them into four 32K-color pixels on the DS screen by performing many palette lookups and regular/weighted averages, as we've seen already. The DS 2D core, on the other hand, can perform alpha blending between two backgrounds, without requiring any effort from the CPU. This alpha blending feature can achieve nothing less than an average between each pixel of the first background and the corresponding pixel on the second background, returning a 32K-color image. (1) Additionally, the 2D core can also perform background scaling. We need to exploit both these features. Since the 2D core can do background scaling, we don't even need to copy specific pixels. Each background can be generated the way we need it starting from the unmodified original image stored in Video RAM using the scaling features. Thus, we program the 2D core to skip one source pixel each group of five, and choose which pixel has to be skipped. You can think of this register as if it was a sort of a counter of the fractional part. We initialize it to a precise value (3/4, in this case) and after each output pixel has been generated, 1/4 gets added to this counter. (It's because 320 divided by 256 gives 1 plus a fractional part of 1/4). When the counter reaches the unit, the scaling process skips one pixel of the original image, and in this case this will happen after processing one pixel. We can also tell the 2D core to use the same 320x200 bitmap for all the backgrounds, then program different reference point X coordinate values for each background. Unfortunately, what we can't ask the 2D core is to blend all 4 backgrounds at the same time. However, we can make it blend 2 of these backgrounds each frame, and blend the other 2 backgrounds the next frame, at 60 frames per second. (2) The LCD screen and our retinas will average the 2 generated images, providing in fact the expected result. DSx86 actually uses a slightly different implementation. It performs vertical scaling at the same time (200 lines down to 192 in VGA "Mode 13h" and 240 lines down to 192 in VGA "Mode X", using different affine matrices) in the so-called 'Jitter' mode. (1) The DS screen output supports 18bpp color, and alpha blending is probably performed with even more precision. (2) Since only BG2 and BG3 support bitmap backgrounds, the code will blend these two, redefining them as needed on each frame.